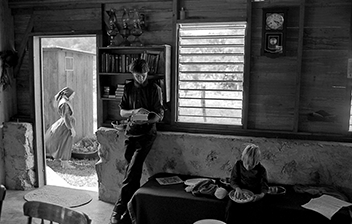 In the month of December 1957, 50 years ago, a group of 30 Mennonites families arrived in Belize, then British Honduras. Real pioneers, farmers, they are now a community of 10000 having - more or less - preserve their way of living and even prosperous. In that, they have been luckier than their fellow‘s parents or cousins of Mexico and Canada still in a woeful state. But battered by new obstacles and challenges the traditions have crumbled. Preaching pacifism, denying all progress and the modern world, electricity, automobiles, television, newspapers and even education, some members, some Colonies have been forced to break certain rules to survive. All these difficulties turn the youths to question more and more their future, their way of life and the future of their coming kids.
" Do not conform to the world ". The admonition is more than ever truth for the group to survive in the world today, where religion often leads to fundamentalism and violence.